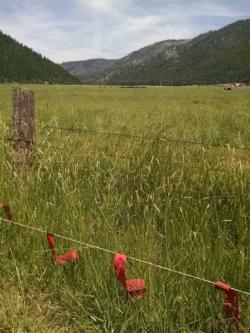 In collaboration with UC Rangelands, multiple monitoring sites were identified in 2012 on grazed meadow allotments across the Plumas and Tahoe National Forests. Meadows are a unique resource, and understanding long term and annual meadow conditions can help balance conservation and livestock production goals in the future. 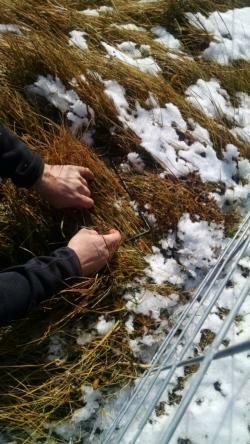 Each year exlosures are placed on meadows before cows are turned out, and at the end of the grazing season (Fall) the meadows are monitored. This project is part of a broader study across California. To learn more click here. The goal of the research project is to provide enhanced irrigated pastureland management for higher economic return to ranchers through increased forage production and environmental outcomes such as water use efficiency. There are 5 pasture locations in Sierra Valley enrolled in a Northern California study focused on integrated management strategies (including grazing, haying, fertilizer, and water practices) for enhancing agricultural, economic, and environmental outcomes. The project kicked off in the summer of 2017 and end-of-season baseline data on pasture productivity, harvest/utilization, and plant community diversity was collected in October 2017. This is a multi-year research and extension project in collaboration with more than 20 ranchers and UC Rangelands, and is funded by Western SARE and the California Department of Water Resources. For more information on the research project click here. In 2017, UC Cooperative Extension and UC Rangelands launched a long-term (15 year) study to better understand the potential direct and indirect impacts to California livestock producers from gray wolves and other predators. To measure changes in these impacts over time, we will be returning to the same operations year-after-year. There are ranchers in Butte, Plumas and Sierra Counties participating in the study. If you have a commercial beef cattle, sheep or goat operation and are interested in participating in this survey please contact Tracy Schohr at tkschohr@ucanr.edu. In 2017, a Plumas County rancher lost numerous new born calves. It is suspected that the calves were taken by bears or lions. Working with local ranchers, there are wildlife cameras set up that are monitored weekly. Cameras were installed a month prior to cattle arriving at the pasture, and will remain throughout the season. Cameras are also capturing an inventory of wildlife on the irrigated pasture. 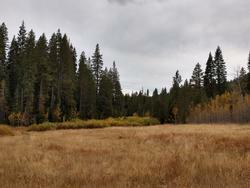 Annual use monitoring site on the Plumas National Forest. Collecting end of season utilization data. Irrigated pasture exclosure and soil moisture monitoring probes (white circles in bottom left of image) in Sierra Valley. 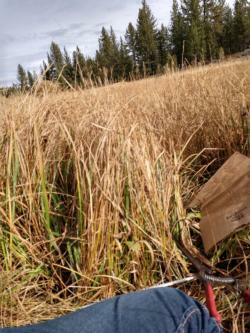 Collecting data at irrigated pasture sites in Sierra Valley. Fladry is a tool that producers can use to help deter predators. 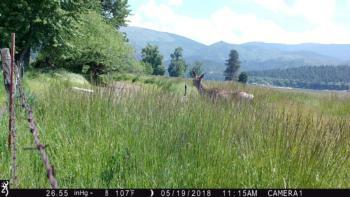 Wildlife using irrigated pasture in Plumas County.